First Car in England Built by a House From Buffalo! If that sounds a little strange, it's not. Not if the house was Harry A. House Jr. of 42 Fordham Drive, Buffalo. He designed, built and drove the first automobile in England. His father is conceded by many to have constructed America's initial automobile, which alarmed the citizens of Bridgeport Conn., in 1866. Retired now after 15 years as chief engineer of the former Wire Wheel corporation of America here, House works daily in a fully equipped machine shop in the basement of his home, perfecting ideas to swell his total of half a hundred patented inventions. The first license that England ever issued, which bears his name, hangs in the club rooms of the Royal Automobile Club of Great Britain, to which both House and the Prince of Wales belong. The license was issued in 1897 at Somerset House where deeds and records are kept in London. It was larger than a present day birth certificate and bore the royal coat of arms. House and his father, Henry A. House Sr., went to England in 1889 to join Sir Hiram Maxim (machine gun inventor) in working out a flying machine. Wilbur Wright came to England at the time to view the invention. Several trial flights ended disastrously and backers of the project eventually withdrew their support. The flying machine was abandoned by Sir Hiram and his two American helpers. The elder House returned to the United States while his son remained in England and began experimentations on a self-propelled commercial vehicle. He evolved a steam driven machine which weighed a ton and a half and which was capable of achieving a speed of 30 miles per hour. The steam was generated by kerosene oil and a funnel led out through the top to carry out the heat. A license had to be taken out before the steam auto could be operated generally on the roads. There wasn't any form to cover such a situation, so one was hastily and elaborately devised. It cost House two pounds (about ten dollars) to take out his first license. The government became interested in the vehicle and as a experiment used it for Royal Mail Service. 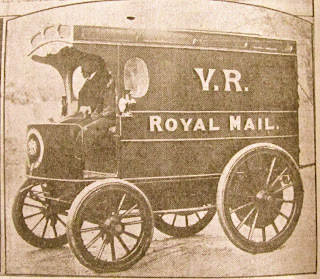 For Six weeks, Houses' automobile carried the mail from London to Riegate, a distance of 30 miles. Sharply at 10 the steam car would chug off on it's mission while crowds gathered to see the horseless contraption make it's way over the bumpy roads. Later house designed a double-decker car with a majestic funnel rearing from the top. This machine was taken to France. The inventor holds a gold medal and two silver for his earlier designs in automotive vehicles. 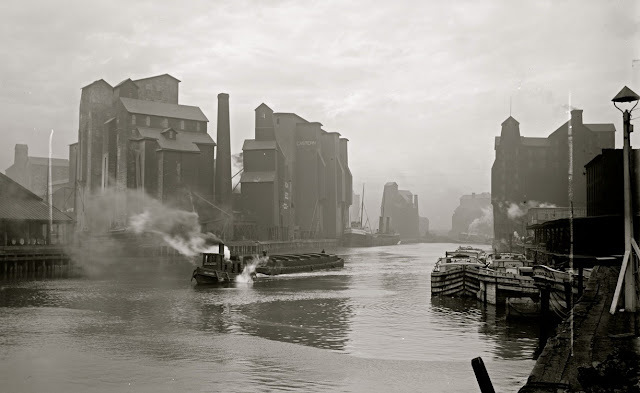 The younger came to Buffalo and took up duties with the Wheel Corporation. He became chief engineer and invented numerous wire wheel designs and processes for making them. He perfected wheel balances, a foot-lifting jack and auto accessories. During the course of his 19 years in England he was made Vice Consul at Southampton. Today he is 65 and still drives an automobile. The senior House died in his Bridgeport home, at the age of 90, in December of 1930. He had invented mechanical devises for the airplane, auto and numerous other types of machinery. Altogether he was credited with over 300 inventions. The story is told in Bridgeport that a balky horse caused House Sr. to invent the first automobile. "Better no horse at all than one that balks," he said, according to legend, then he set about designing a vehicle to eliminate the cantankerous horse. Editors Note: Hiram Maxim did actually achieve flight by accident although not "controlled." Just a few feet off the ground then crashed. He used lightweight steam engines. The area he was testing at did not allow for full takeoffs. The steam engines, although powerful enough to lift the huge aircraft could not hold enough water for anything other than a short flight even if it could take off. 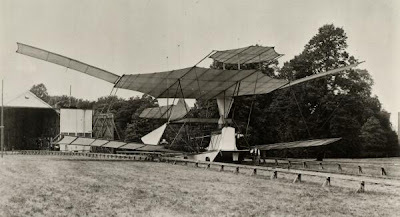 Search: Hiram Maxim airplane, for details on his flight experiments in the 1890's. I am still researching the Henry A. House Sr. automobile in Bridgeport Conn. If anyone has information on any of the inventions mentioned in this story, please contact me by email.